Qligent will demonstrate its ability to evaluate ATSC 3.0 signals relative to best practices and performance benchmarks. The ATSC 3.0 standard will open new business models and opportunities for broadcasters that are largely due to its inherent IP networking attributes. Vision-ATSC poses valuable benefits to Lighthouse station operations, co-located stations sharing either ATSC 1.0 or 3.0 transmission infrastructure (Co-Los), channel sharing, single-frequency networks, and service level agreements (SLAs) that will become common in an ATSC 3.0 universe. At 2018 NAB Show, Qligent will demonstrate Vision-ATSC, a transitional path from ATSC 1.0 to ATSC 3.0 signal monitoring and analysis. Vision-ATSC software poses compelling business and technical benefits for Lighthouse Stations, SLAs, and other new ATSC 3.0 business models. Vision-ATSC is a cloud-based, enterprise-level content monitoring and analysis solution. 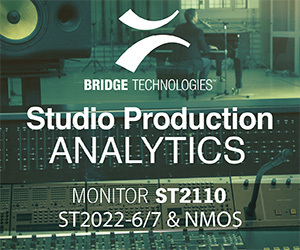 It empowers broadcasters to accurately monitor the many layers and protocols that are unique to the ATSC 3.0 standard and analyze performance through to the last mile. Vision-ATSC is a software module within the Qligent Vision cloud-based monitoring solution, a broad toolset for monitoring and analyzing the Quality of Service (QoS) and Quality of Experience (QoE) characteristics of multiplatform broadcast signals from the encoder out to the last mile. At the 2018 NAB Show, Qligent will demonstrate its ability to evaluate the integrity of ATSC 3.0 signals relative to best practices and performance benchmarks. Qligent experts will also explain how broadcasters can use Vision-ATSC to measure baseline RF performance today, and prepare for a clean transition to monitor, analyze and troubleshoot the broader subset of layers and signals within ATSC 3.0’s native IP architecture. The same common off-the-shelf hardware configuration will support ATSC 1.0 today and ATSC 3.0 when broadcasters are ready to migrate. Because Vision-ATSC evaluates both ATSC 1.0 and ATSC 3.0 signals, broadcasters can use Vision-ATSC to establish a baseline of ATSC 1.0 performance and provide monitoring and oversight throughout the ATSC 3.0 transition for greater operational continuity. Vision-ATSC monitors and analyzes ATSC 3.0-specific protocols, such as ROUTE-DASH and MPEG Media Transport (MMT), as well as the multiple 4K/HDR/WCG/UHD signals, HEVC encoding, MPEG-H immersive audio, datacasting and mobile reception that are inherent to ATSC 3.0. Vision-ATSC provides broadcasters with an easy-to-use cloud-based workflow that correlates and analyzes multi-layer data from nine distinct points along a signal path that spans from the broadcast gateway input sources to the antenna’s RF output. Four data points of direct multi-layer stream analysis, and five data points from vendor equipment, are reported throughout the ATSC 3.0 ecosystem. This data illuminates system configuration changes, problems and other issues so broadcasters can take steps to quickly optimize their ATSC 3.0 service.